The sea here off Margate is very shallow, with a tide that goes out for miles, uncovering an extraordinary reef of rocks and pools. Right outside the house was once a wooden jetty, to which large boats would bring tourists from London, until it was destroyed in a storm. These boats, and the jetty itself, all had dining rooms for the tourists, each with their own distinctively branded crockery. Any that got broke… went overboard, lingering in the not-so-depths for a century until the tide does its thing and throws it back onto the beach. 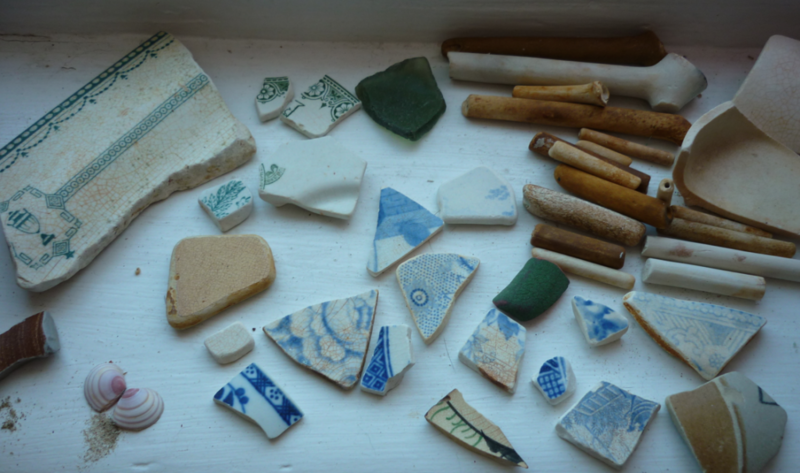 This means that the beach at low tide is rich in bits of crockery, many of which are identifiable as being from this steamer company or that dining room. A slow stroll along the shore with your eyes on the sand is bound to reveal some treasures, and the little hit of dopamine one gets when one finds something is… of course… addictive. I’m not a natural collector. Or rather, not a completist. I get bored too easily and move onto the next thing. 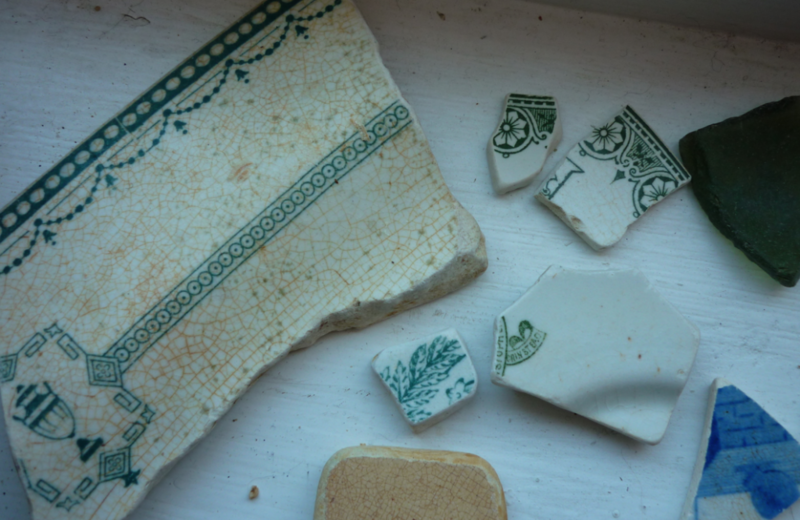 But I love being able to find bits that clearly come from the same place – see my green shards of crockery (above) from the New Palace Steamer Company. If I keep going I’ll have enough for a full plate! 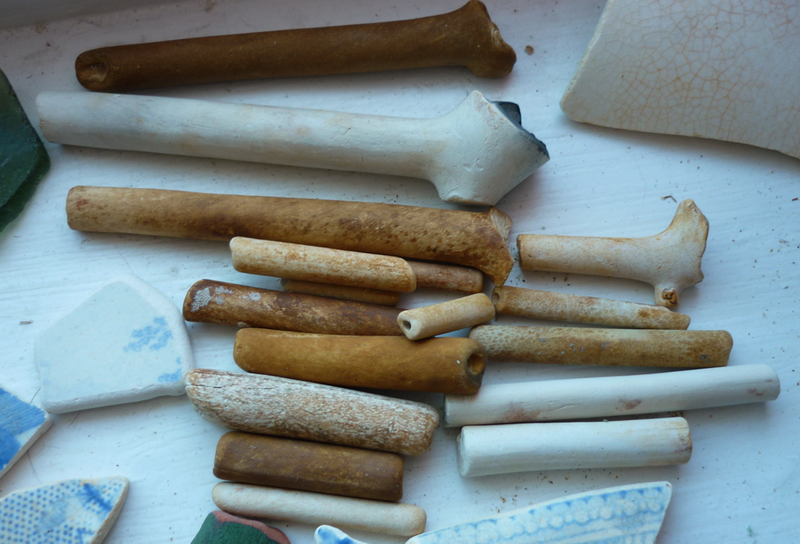 Another thing that is all over the beaches are bits of clay pipe. I’ve heard that a wreck off Margate had a consignment of them that went into the drink, but also that they were mass produced and ready-packed with tobacco, so you smoked it then chucked it away. I met a guy on the beach who had found a complete one with an incredibly thin stem (I think the thickness of the stems is a way to date them) that has lain unbroken in a rock pool for – possibly – centuries. I was wild with envy, but found this baby in a little beach stream just afterwards. I love the nerdy aspect of beach combing, but more than anything, for someone without a dog, it’s another good reason to spend lots of time on the beach. Something about the slow walking and the narrow focus is totally therapeutic and calming. Although…. I have yet to find a shard of the quite common ‘Margate Jetty Dinning Rooms’ pottery and my friend found some within ten minutes of stepping onto the beach. Did I let my jealous rage get the better of me? No, I just paced on, slowly, slowly, looking for the next piece of pipe. Do you know the book ‘London in Fragments – a mudlark’s treasures’ by Ted Sandling? He’s london_mudlark on instagram and he researches all his finds and pieces together stories form history, I think you’d love it. My finds on the Thames are very meagre compared to yours but I do use the pipes in my chandeliers sometimes as they’re ready made beads. Happy hunting! This is great, I’m the same but grubbing for broken tiles and crockery from the garden of my Victorian house. The question is how to display it artfully without covering every available surface? Lovely! That is better than collecting shells from the beach.Thank you for the good idea.